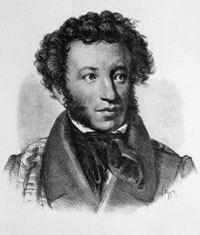 Russia marked the 172nd anniversary since the death of the Great Russian Poet Alexander Pushkin. One of the greatest Russian poets and writers died February 10, 1837 in his St. Petersburg apartment after the duel with Georges d’Anthes. The duelists fired their guns being only 20 steps away from each other. D’Anthes mortally wounded the poet and he died two days later. The Pushkin Museum of Fine Arts as founded in Moscow over 50 years ago. The museum announced a moment of silence when the poet’s heart stopped beating 172 years ago at 2:45 p.m.
St. Petersburg-based scientists said that they were about to discover new facts about the tragic death of the Great Russian poet. Specialists said that they had possibly found a new item that could be directly relevant to the last days of Pushkin’s life. An old leather couch has been an exhibit of Pushkin’s study for more than 70 years. Museum guides always said that the poet was dying on an exactly the same couch after he had been wounded in the duel. Galina Sedova of the Memorial Museum of Alexander Pushkin always wondered why the Hermitage delivered the couch to the memorial museum in 1937. The previous owner of the couch served as an academic secretary, the couch found itself in the store-rooms of the nation’s major museum and was never exposed to any restorations. Galina Sedova believes that if it is the couch of the Pushkin family, then it was most likely the couch on which the poet died. Professor Yury Malin, the chairman of the regional Forensic Medicine Department, said that specialists had found traces of blood on the couch. The analysis showed that the blood belonged to a male. The research began in September 2008. “When I had a look at the couch I found many cracks and saw that the upper layer of the couch had been seriously damaged. That is why I did not even hope to find there anything,” the scientist said. The specialists took 26 samples but found blood traces only in one of them. They determined that the blood belonged to a male, but found it difficult to identify the age of the blood traces because the stain was very old. The experts also found the A antigen in the stain, which indicated that it was either the second or the fourth blood group. Now the experts will compare the blood stain on the couch with the blood samples on the vest, which Pushkin was wearing on the day of his duel with d’Anthes. Modern science also rebutted one of the popular versions of Pushkin’s death. The version particularly says that the poet could have survived if he had been taken to a hospital immediately after the duel. However, a deeper insight showed that the low level of medicine of the 19th century excluded such a possibility. “The hospital aid of that time was basically the same as that provided by the medics who visited Pushkin at his home,” Yury Malin said. The blood stain found on Pushkin couch brought up the idea of cloning the poet. “It does not make any sense to recreate the biological material. The clone would differ from his prototype anyway,” the specialist added. He added that he totally shared the views of the Russian Orthodox Church regarding the question of cloning. “ There was only one Pushkin . There can be no other ,” he said . The leader of the notorious organization Communists of St. Petersburg, Sergei Malinkevich, believes that the cloning of the Great Russian Poet would be justifiable. “We could clone him just because of the fact that his life ended so early. What if the cloning could give us a new genius?” he said. There is another, a more realistic approach to Pushkin’s persona and his work. One has to give a whole new meaning to his work to bring the poet closer to modern-day Russians.